Spring is in the air and our thoughts inevitably turn to having a good tidy up and de-clutter, so this month we thought you’d like to hear about our volunteer-run fundraising charity shop. It’s a great place to donate your unwanted items – and to shop too. Having a good clear out and sorting through your clothes, books and other household items may not be everyone’s idea of fun, but the benefits of donating these items is immense. The income from our shops – we also have one in Mumbles – is our main source of regular income and is vital in helping the cats and kittens of Swansea. Put simply, we couldn’t carry on without it. Our fundraising charity shop, located in Brynymor Road was opened by a small group of dedicated and loyal Cats Protection volunteers nearly 11 years ago and is still going strong. The volunteers set about locating and leasing suitable premises and worked hard to renovate and fit out the shop ready to open in October 2008. They painted walls, laid down carpet, put up shelves – and apart from a few essentials from CP HQ, they fitted the whole place out almost entirely by using materials they could gather from home…a thrifty lot! This ethos of being thrifty has continued to this day, because every penny taken in the shop, once rent and essential bills are paid, goes directly to help the cats and kittens of Swansea. William Morris famously said ‘Have nothing in your home that you do not know to be useful or believe to be beautiful’. What we might think is useless or unlovely can be found to be useful and loved again once donated to our charity shop. As volunteers we differ enormously in our tastes so that when people donate to us we rather enjoy discussing what will sell, what is lovely or useful. It can be fun guessing whether a particular item will sell quickly or not! But seriously, the emphasis on fun and camaraderie among our shop volunteers is what drives us to turn up day after day, week after week and year after year. Indeed, some of our truly wonderful shop volunteers have been turning in a shift in the Brynymor Road shop for over a decade, a remarkable contribution to raising money for Swansea Cats Protection. Our wonderful customers are many and varied, with some being loyal from the first opening of the shop back in 2008, so it’s inevitable we get to know them well and see them through happy and sad times alike. Our customers like a chat, and so do our volunteers, we’re all part of the local community. We can help kit out people with what they need for their kitchen, from a single spoon to a set of saucepans; and for their bedroom, from beautiful vintage glass perfume bottles to a king-sized duvet cover set. A few months ago, we launched our shop Facebook page and with volunteer Amy taking up the helm, it has gone from strength to strength. We recently introduced a furry feline contributor called Barney, who wanted to share his vast knowledge of bargain hunting with everyone. Gorgeous boy Barney features every Saturday with his choice of what’s trending in the shop…look out for Barney’s Best Buy! So, if you’d like your unwanted things to get the once-over from our very own ’King of Shops’ Barney, why not get de-cluttering and donate to our Brynymor Road charity shop? You’ll get a warm welcome from our shop volunteers and you might pick up a bargain yourself while you’re there. Our Cats Protection Charity Shop can be found at 85 Brynymor Road, Swansea, SA1 4JE, tel. 01792 654342. If you are interested in adopting or fostering one of our lovely cats or kittens, please get in touch and arrange to come and meet the cats waiting patiently for a loving home. Please note our Helpline is answered by a messaging service and we will respond as soon as we can, but please be patient and remember that we are all UNPAID VOLUNTEERS trying to do our best for the rescue cats and kittens of Swansea. By supporting our shop you help cats like Tootsie (left) who is still wondering why she hasn’t found a new home. 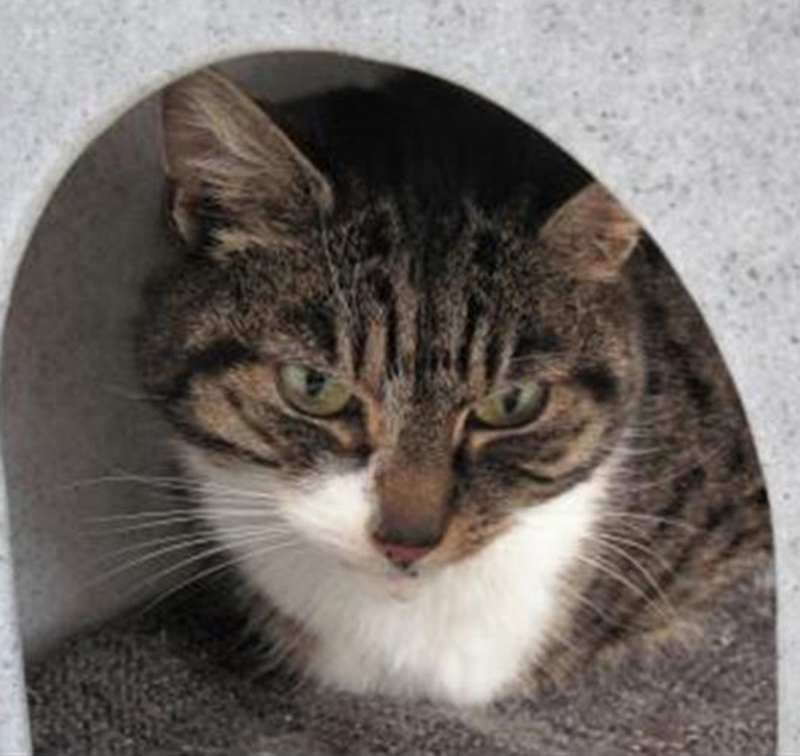 This lovely mature puss came to us when her beloved elderly owner sadly died, and was understandably quite bewildered by her new circumstances. But with love and kindness she has gained in confidence and is now more than ready to leave our care. She would like a quiet home and be the only pet in the household – she will make a sweet, gentle companion. Come and meet her.